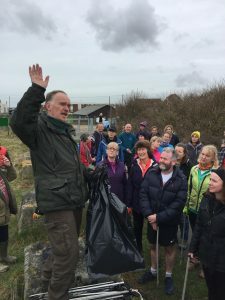 Members of Rye Runners special beginners group as well as the regular Saturday club relocated to Winchelsea Beach last Saturday (March 4) to join in a spring beach-clean initiative. About 50 Rye Runners gathered at what seemed like the crack of dawn (9am, but it was cold and drizzling). We ran for what seemed like hours and hours, with both groups including a tabata in their training – this is an intensive session of multiple short sprints followed by rest periods, pioneered in Japan. Brightly coloured and superfit, the runners attracted a crowd of spectators and some excited dogs joined in the entertainment. Rye Runners has recently set up a “run4good” initiative which combines useful community assistance with one of the regular running sessions. 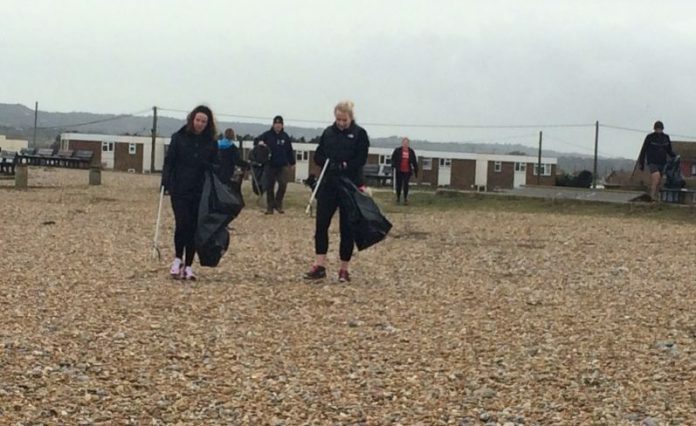 After the sessions ended and we had enjoyed a cup of tea and an orange and chocolate biscuit, most of the group stayed to clean up the beach. We started from the pavilion and worked to the left. Most of the debris was plastic including multiple bottle tops and string from fishing nets. Rye Runners meet every Saturday on the Salts at 9am. The beginners’ course which started in January is approaching its final week, but a new one is starting on Wednesday evenings from April 19. I strongly recommend it. The course is a laugh a minute and enables people with very varied fitness levels to get some exercise and enjoy themselves.